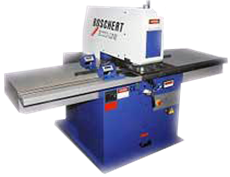 Look Through below Source Catalogs or Click on OEM Logo to visit their websites. Once you find equipment your interested in, let CET offer you great price! TK#12 Station Punch Range 1/8—1-1/4 Comes with sizes: 1/8, 3/16, 1/4, 5/16, 3/8, 1/2, 5/8, 3/4, 1, 1-1/4 Est. Weight 480lbs. TK#18 Punch Range 1/8—2-1/4” 8 Tons, throat Depth 18” Comes with sizes: 1/8, 5/32, 3/16, 7/32 ¼, 9/32, 5/16, 3/8, ½, 5/8, ¾, 7/8, 1, 1 1/8, 1 ¼, 1 ½, 2, 2 ¼ Est. Weight 535lbs.